OMEGA’s rugged Compression Fitting Thermocouples are ideally suited for measuring plastic processing machinery temperatures at the crosshead, die, and barrel. It is ideal. The maximum length for armored cable is 40 feet (5 feet is standard). Dual elements are available. The standard termination is Style 1 or Style 2. Style 3 is available upon special request. 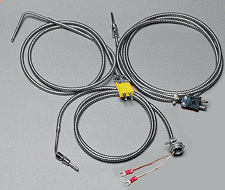 Probes with 45°bends are also available. Consult Sales Department for availability. Nota: Price includes 3 /16" sheath diameter probes, brass compression fitting with 1 /8" NPT, and 1.5 m (60") lead length. Grounded junction standard. Ungrounded also available.